Nearly six years ago, in December 2005, I posted this short sketchy video which animates views of council flats undergoing demolition. 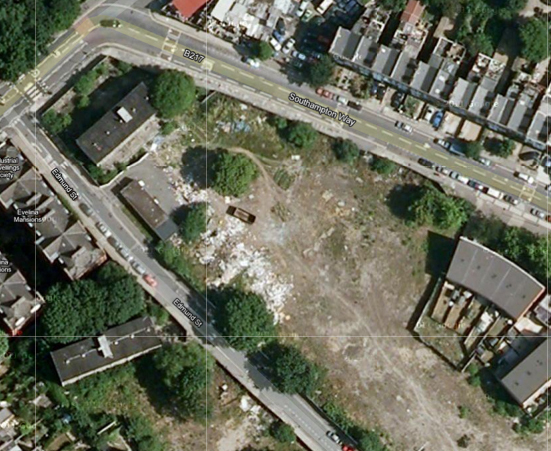 The photographs were taken in August 2005, the Elmington Estate being demolished is just on the edge of Burgess Park on Edmund Street, Camberwell, South London. I have just reposted it as part of an occasional series for which I plan to post 'archival' Direct Language videos as some of the links to the original videos at the Internet Archive seem to be broken. it has been transformed into a wasteland by Southwark Council, which has since handed it over to Notting Hill Housing for regeneration. On the face of it Notting Hill Housing seems to be a perfectly responsible, local organisation with an interest in social housing, which is in some contrast with the global developers the council uses elsewhere for more lucrative high profile developments such as the Heygate Estate at Elephant and Castle. But after six years the site remains uninhabited, where the decanted residents are now who knows, or whether they to be part of the new community, and the regeneration plans as outlined by Southwark Council are ambiguous indeed.